A comprehensive trio of lenses, the Rokinon SP 14mm, 50mm, and 85mm Lenses Kit from B&H bundles the three bright, manual focus lenses together to cover ultra-wide, normal-length, and portrait-length fields of view. A super wide-angle prime designed for Canon EF-mount DSLRs, the SP 14mm f/2.4 from Rokinon pairs an advanced optical design with simple, intuitive handling. Incorporating 18 elements in 14 groups, this lens utilizes a series of aspherical, low dispersion, and high refractive index elements to reduce color fringing, aberrations, and distortions for sharp, clear, and color accurate imagery. An Ultra Multi-Coating is also featured, as well as a built-in lens hood, to suppress lens flare and ghosting for improved contrast when working in bright, direct lighting conditions. Complementing the imaging assets, a manual focus design is employed that permits working with subjects as close as 11" away, and the aluminum-alloy housing is both lightweight and durable to support working in a variety of conditions. Super wide-angle prime lens designed for full-frame Canon EF-mount DSLRs, this lens can also be used with APS-C models where it will provide a 22.4mm equivalent focal length. The complex 18 elements, 14 groups optical design includes two aspherical elements, one hybrid aspherical element, two extra-low dispersion elements, and three high refractive index elements, which all combine to reduce spherical and chromatic aberrations and color fringing, as well as improve sharpness, clarity, and color accuracy. An Ultra Multi-Coating has been applied to individual elements to minimize ghosting and flare for increased contrast and color neutrality when working in strong lighting conditions. Manual focus design permits working with subjects as close as 11" away. Built-in petal-shaped lens hood blocks stray light from reaching the front element and also offers some physical protection against light impacts. Aluminum-alloy housing is both durable and lightweight. Distinguished by its ultra bright design, the SP 50mm f/1.2 from Rokinon is a fast normal-length prime for Canon EF-mount DSLRs. Aspherical and high refractive index elements are used to reduce spherical aberrations and distortions in order to realize a high degree of clarity and sharpness, and an Ultra Multi-Coating is also featured to suppress ghosting and flare for increased contrast and color fidelity. It's impressive f/1.2 maximum aperture also benefits working in low-light conditions and affords extensive control over depth of field for working with selective focus techniques. Additionally, the manual focus design contributes to the precise control over focus, and an aluminum-alloy housing benefits handling as well as improves overall durability. Normal-length prime 50mm f/1.2 lens is designed for full-frame Canon EF-mount DSLRs, however can also be used with APS-C models where it will provide an 80mm equivalent focal length. Fast f/1.2 maximum aperture offers a high degree of control over depth of field for working with selective focus and shallow depth of field techniques. Additionally, it also benefits working in low-light conditions with slower shutter speeds. One aspherical element and one high refractive index element is featured in the optical design to control spherical aberrations for improved clarity and sharpness throughout the aperture range. Manual focus design permits working with subjects as close as 1.5' away. Nine-blade diaphragm contributes to a smooth and pleasing bokeh quality. Rear contacts afford full camera-based control over exposure settings and also relay Exif data between the lens and camera body. Characterized by a sophisticated optical design, the SP 85mm f/1.2 from Rokinon is a portrait-length prime lens for Canon EF-mount DSLRs. One aspherical element and a pair of high refractive index elements are used to reduce spherical aberrations and distortions in order to realize a high degree of clarity and sharpness, and an Ultra Multi-Coating is also featured to suppress ghosting and flare for increased contrast and color fidelity. The lens also sports an impressively fast f/1.2 maximum aperture to benefit working in low-light conditions as well as for controlling depth of field for selective focus effects. Additionally, the manual focus design contributes to the precise control over focus, and an aluminum alloy housing benefits handling as well as improves overall durability. Classic portrait-length prime, this 85mm f/1.2 lens is designed for full-frame Canon EF-mount DSLRs, however can also be used with APS-C models where it will provide a 136mm equivalent focal length. Fast f/1.2 maximum aperture offers a high degree of control over depth of field for working with selective focus and shallow depth of field techniques. Additionally, it also benefits working in low-light conditions with shorter shutter speeds. One aspherical element and two high refractive index elements are featured in the optical design to control spherical aberrations for improved clarity and sharpness throughout the aperture range. Manual focus design permits working with subjects as close as 2.6' away. Aluminum alloy housing is both durable and lightweight. Box Dimensions (LxWxH) 7.7 x 5.2 x 5.1"
Box Dimensions (LxWxH) 9.0 x 6.0 x 6.0"
Box Dimensions (LxWxH) 7.6 x 5.2 x 5.1"
SP 14mm f/2.4 Lens for Canon EF is rated 4.3 out of 5 by 9. Rated 5 out of 5 by Bruce from Blown Away! 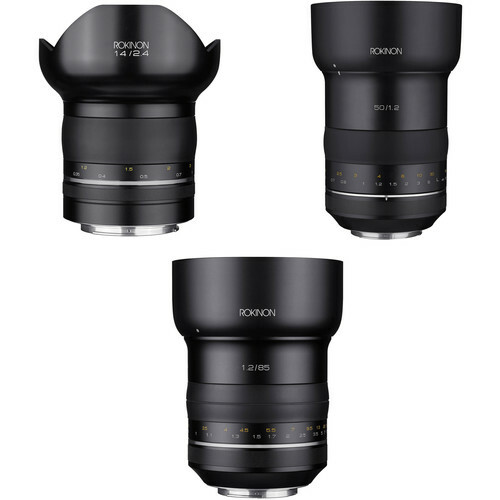 Rokinon has seriously upped their game, . . following Sigma's path? Great build, smooth as silk focus ring, smart and useful lens cap design (it stays on going in and out of the field kit!) impressive corners wide open and razor sharp by f/5.6 Shooting Real Estate with the supreme Canon 16-35 IS, there are times when it's helpful to have a 14mm option. Other then a slightly warmer cast then the Canon, this lens matches the canon pixel for pixel. The distortion is not complicated and the LR profile is minimally destructive to your file. This optic is easily worth the list price, at the current discount this is a steal! Seriously, this is a no brainier. Rated 2 out of 5 by Claude from Good optical design.. but serious issues First I want to comment on B&H first class service. I got issues on 2 consecutive samples of this lens and each time B&H went beyond what I was expecting. Great company! General comments about the Rokinon. This is part of the new Premium series. It has been tested by several reviewers as the sharpest 14mm optics you can buy. I would say optical design is good but there are problems. Infinity focus is found at about 3 meters mark because the field is not flat. It actually goes from 3m to true infinity at about 8mm from image center then goes back to 3m in corners (21mm). So it is not really that easy to manually focus using the marks, and under 2 meters you may want to use live view anyway. At F2.4 I made some tests and I think only 15% of light reaches the corners (21mm). The slope of vignette is very steep as soon as you leave image center. However when you close the iris, focus and vignette improve quickly. On the mechanical side, the iris makes a noise when you attach the lens. I'm OK with that but it makes you thinking how that works compared to other makes. Only 3 screws to hold the metal mount, no weather sealing, no external mark to insert lens on camera. Focus is manual, smooth, but has no user infinity lock. Rubber takes dust easily. Lens hood works well (unlike Canon 8-15mm one) but some abrasion seem to happen during shipping . Nice pouch. Problem on sample 1. I could not focus star fields because the lens was tilted horizontally. Other than this annoying issue this sample was very sharp. Problem(s) on sample 2. Right away I got the iris getting stuck at full aperture on a single image (just one image in the middle of other ones). Then again the lens was tilted very obviously but vertically this time (I also tested with another camera). Finally I noticed the lens was kind of smooth. On a star test there was an obvious horizontal spread to the right (decentering). There is no Premium here just issues when you consider the steep price! Rated 5 out of 5 by David from Beyond expectations I must admit to being a little skeptical about the performance of this lens when I ordered it.? I read many reviews and it sounded very good. The lens is not weather proof but the build quality looks great and anyway, one drop of water on that nice big front lens element would show in any photo I suspect. ?My initial tests of a plain brick wall shot from about 3 metres away just blew me away.? It has edge to edge sharpness and very little distortion or chromatic aberration.? Pretty good at f2.4 and excellent at f4 – f11 after that diffraction shows a little and the images are similar to that of f2.4 but still very usable.? Tested compared to my Canon 17-24mm f4, the 14mm was better on every test.? Slightly better at f5.6 to 11 but miles better wide open compared to the Canon at f4 17mm. To those who think they need auto focus.? No you don’t for 90% of the time with a 14mm.? You almost can’t miss focus with this lens.? It does have focus confirmation in the viewfinder and that works really well.? But even wide open at infinity objects 3 metres away look pretty good. ?I would think that auto focus would make the lens focus too much on the foreground and risk getting infinity/skies/horizon out of focus in many cases.? The focus ring is nice and firm whereas if it were auto focus and you switched to manual it would be quite loose.? Not a good thing if you plan to do night shots as it could easily move.? All in all, a great lens – couldn’t be happier with it. Rated 5 out of 5 by Joris from a tack sharp wide angle lens I had the Samyang 14 mm f2.8 for over 5 years to my satisfaction, but had sometimes issues to obtain a good focus.? This was an incentive to buy this lens which is also a Samyang made lens.? After using it for a couple of weeks I can conclude that the lens give tack sharp pictures, better than the previous.? I also love the focus confirmation chip which helps me to? shoot sharp pictures.? In all, I found that the lens confirms what the reviews are saying, to my satisfaction. Rated 4 out of 5 by Richard from Milky Way I've tested my lens twice since receiving it. One session photographing a church finding little distortion compared to the Rok 14mm f2.8. Milky Way - I've used the lens only a single night in brutally cold weather; 6 degrees air temp and 25+ mph constant winds. The lens held up very well. The photos look great. Also, easier to focus infinity on the lens than the Rok 14mm f2.8. I do need to get used to the focus ring. The lens contains a chip so you can see the f stop setting in your viewfinder; eliminates wrong fstops since I shoot mostly f2.8 at night. I did use f2.4 and f4 for night shots. I expect f2.4 will help on nights when the fog or clouds roll in and we need to capture an image fast. The lens cap's a bit smaller, but I found it more difficult to remove the lens cap with gloves on versus the 14mm f2.8. Another issue like the f2,8, I wish they'd put the red dot for mount alignment on the lens barrel versus inside the lens mount. I use the lens primarily at night under a red headlamp and difficult to see the alignment dot. I've since marked the lens barrel over the alignment spot with bright green duct tape. Overall, pleased with the lens. Rated 5 out of 5 by Juleann V. from so far, so good I purchased this lens for my burgeoning interest in astrophotography. There were only a few reviews of its performance, but based on the quality of the 2.8 version it seemed like a good bet. I cannot speak with any expertise to its technical virtues so will post a couple images instead. I think it's a good-looking lens -- to the extent that physical attractiveness is important. It is comfortable on the camera. The focus ring moves smoothly. Both images were 20 seconds @ f/2.4, ISO 3200, Canon 5D MK III. Rated 5 out of 5 by Richard from Lr just added the profile for this lens. I bought this lens for night sky photography.? I appreciate the connection for exif information.? And, the control of aperture is very nice.? Still a manual focus lens, but okay for my purpose.? The design/build is much improved over previous lens.? 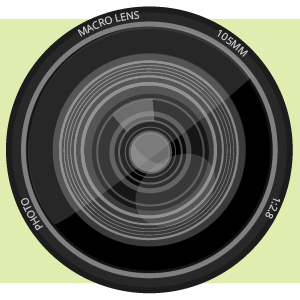 Adobe Lr CC Classic just added the lens profile for this lens.? It helps a lot. Rated 4 out of 5 by John from I like this lens! I have only taken test shots, but it seems sharp, contrasty, centered, I can't see any coma and you have to try hard to get flare. Distortion seems low, too. A test shot (attached) shows the flare when you shoot directly into the sun. I may move this up to a 5 after I use it a bit. Unfortunately there are not any specific filter holders for use with this lens as of yet. Does this lens have manual aperture control? The lens communicates with the camera for aperture settings unlike the Rokinon 14 mm 2.8. I previously had the 14mm 2.8. This lens is far superior to that lens. Definitely worth the extra money. Does this lens have the dreaded moustache distortion like the f2.8 model? Hi there. I have not noticed mustache distortion, but there is noticeable barrel distortion. Does this lens have a focus confirmation chip? Is this compatible with Canon 7D APS-C body?? Hi Jun, I bought this lens last summer to use on both my Canon 7D Mark II and 5D Mark IV. It is a great lens for star photography!